Critical systems which cannot tolerate any outages or interrupts rely on standby power systems that automatically engage when the primary supply fails. For many electronic systems, the back-up power comes from battery systems. Large scale installations may also use a natural gas, liquid propane (LP), gasoline or diesel fueled generator for larger loads or lengthy outages. Another option gaining acceptance is fuel cells. 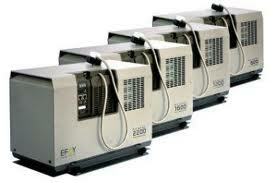 These are popular where low-cost generators cannot for environmental or planning reasons be implemented. As with all Uninterruptable Power Supply (UPS) systems, high standards of reliability are vital. Fuel cells meet this demand with their low moving-part count and clean technology. Similar to battery systems, fuel cells are easily scalable by daisy-chaining together multiple units. A typical fuel cell standby power system can range from hundreds of Watts to over a megawatt in capacity. Also like a battery, the fuel cell electrical output is usually 12VDC or 24VDC, which can easily be stepped up using an inverter to supply 110VAC or 220VAC. The technology behind fuel cells has been around since the 1840’s and was initially used in the 1960’s by NASA for powering space craft. A fuel cell generates power by harvesting the component electrons and protons of the fuel and converting them to electrical power. The only by-products, or emissions, from a fuel cell are heat and water vapor. The two most commonly used fuels are hydrogen and methanol. Hydrogen is obtained from water using an electrolysis process, and is stored like any other fuel until needed by the cell to produce electricity. Hydrogen fuel is fed into the “anode” of the fuel cell. Oxygen (or air) enters the fuel cell through the cathode. Encouraged by a catalyst, the hydrogen atom splits into a proton and an electron, which take different paths to the cathode.The proton passes through the electrolyte. The electrons create a separate current that can be utilized before they return to the cathode, to be reunited with the hydrogen and oxygen in a molecule of water. As more of the existing infrastructure requires reliable uninterruptable power systems with dedicated standby power, the deployment of fuel cells will become more prevalent. Coupled with other forms of off-grid power sources, such as solar arrays, critical systems will have a steady and continuous power supply to remain active and operational at all times.